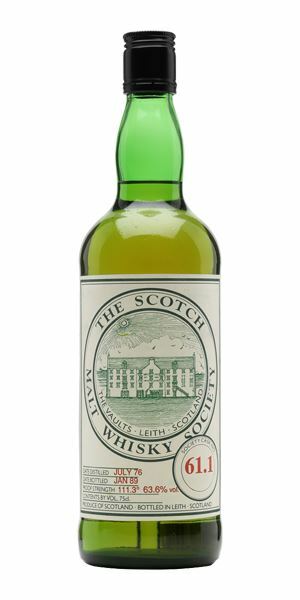 For this week’s rare whisky reviews, Angus MacRaild picks out three old, extremely scarce – and, in two cases, historically important – bottlings from the Scotch Malt Whisky Society (SMWS). 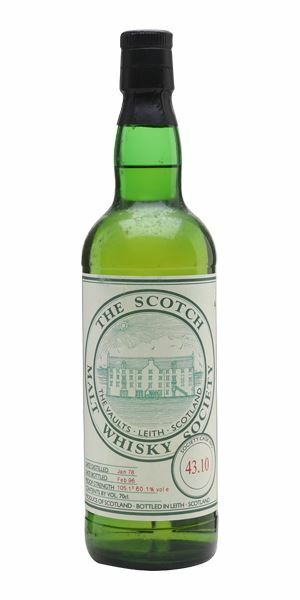 It’s easy sometimes to overlook the importance of the early SMWS bottlings in laying the groundwork for the more widespread appreciation of single cask, cask strength single malts that blossomed quietly throughout the 1980s and 1990s. 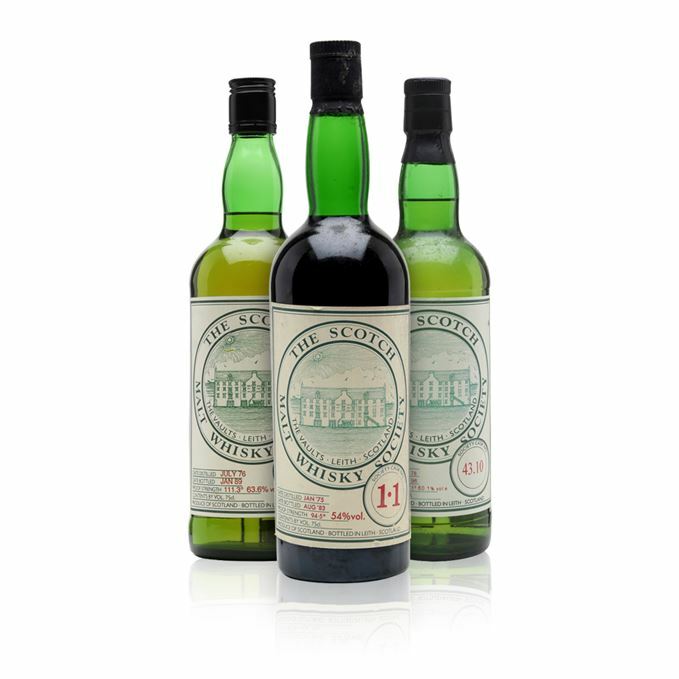 Along with other new-wave Scottish bottlers such as James MacArthur, and latterly Signatory, the SMWS slowly evolved ideas of what kinds of whisky could be bottled, and how they were bottled. Diving in at the deep end, MacRaild finds much to admire in what is not only the first SMWS bottling of Brora, but the first commercial bottling of it as a single malt. Distilled in 1976 and bottled in 1989, the 61.1 Brora proves a satisfyingly big, classically peat-forward example of this mythical make. The Brora bottling undeniably enjoys something of a cult status among enthusiasts. However, thanks to the perhaps unintended quirks of the Society’s coding system, Glenfarclas 1975 1.1 carries an understandably hallowed iconography about it – one with a more direct and broader appeal than the 61.1 bottling. However, as MacRaild notes, it is a vastly different animal to the potent Highlander. Last, but by no means least, a scarce example of one of the Society’s Port Ellens, 43.10, is a 1978 distillation bottled in 1996, one which MacRaild finds exemplifies the distillery’s better, and more enigmatic, qualities. 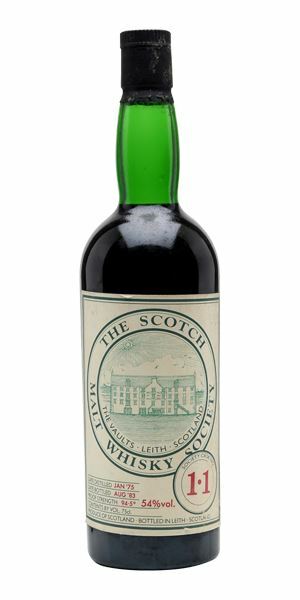 It’s worth remembering that this is not only the first SMWS bottling of Brora, but the first bottling of Brora as a single malt in its own right. This is bigger and far more muscular than other 1976 Broras at first nosing. It’s all scented candle wax, seashore, lively minerality, light natural tar, hessian, peat oils and wet beach pebbles. Quite beautiful. Some citrus peels and lemon oil emerge with a little time. With water the farminess is louder, a whole loft of hay, a horse stable and dense engine oil holding it all together. There’s this raw, smoked gristy aspect at first, but it quickly gets swept up in aspirin, squid ink, olive oil and raw peat. More lemon, barley water, fresh oysters and a rather emphatic farmyard quality. The waxiness remains very present in the background, like a sheen coating everything. Some green olives in brine, black pepper, smoked oatmeal and a preserved lemon or two. With water more green olives, some soot and thicker, more one-dimensional waxiness, and also some wild flowers and sea greens. Quite remarkable length. Fulsome, coastal, waxy, peaty and farmy, with a pristine, chiselled edge. A historic bottle that also contains some truly remarkable whisky. Originally sold for about £14 at time of release, if I recall correctly. Leaning back, closing your eyes and trying not to think about The Green Manalishi. It’s a dense, thick and emphatic old-school Sherry cask, billowing fresh black coffee, crumbled bitter chocolate, strawberry liqueur, sods of wet earth, pomegranate molasses and cherry Tunes. Goes on with some warming winter spices, muscovado sugar and some pretty dense and sticky Dundee cake covered in glazed dates, stewed prunes and lashings of old Armagnac. Water brings more fresh earth, warm brown bread, various toasted seeds, maraschino cherry and even a hint of fruity chutney. You could probably make some kind of ridiculous Manhattan with this, a ‘MacHattan’ (is that already a thing, cocktail people?). Well, you could if you were a rich and terrible person, anyway. Muscular Sherry, but not overpowering. A slight diesel edge with some dunder-influenced Demerara rum as well. There’s also lightly salted liquorice chews, macadamia nuts, walnut wine, some aged Boal Madeira and a hint of Maggi liquid seasoning. A black pepper-infused bitterness pervades everything in a rather lovely way. With water you have a little cedar, some drying spices, nutmeg, lemon jelly and then back to things such as bitter chocolate, earth, soot, balsamic and some warming tobacco notes. Rather long, leafy, spicy and nervously chocolatey as well. Braw! It’s an almost mythical bottle and who the hell knows when another will be opened? Still, it’s easy to get lost down the rabbit hole of legend when tasting these wee nuggets of liquid history. I still feel it is genuinely very good whisky though, if you like these big, über-punchy but clean, old-school Sherry bombs. Which I do. A lock-in at the Vaults. You slip off your shoes and disappear into one of those bottomless leather sofas. There’s this kind of emblematic pure dirtiness that so typifies this latter era of Port Ellen. Bandages, wet rocks, kelp, ointment, tarry rope, mercurochrome, black olives, brine and a little chamois leather. Powerhouse stuff. Goes on with some grilled scallops with lemon juice, and then starts to evolve more towards partially malted barley, cooling wort and peat embers. Washing dried next to the maltings on Islay. With water there’s soft citrus, white flowers and a few dried herbs such as rosemary, tarragon and parsley. It’s gentler in the mouth than the nose suggests. There’s all this prickling medicine, antiseptic, Dettol, sheep’s wool and a few gorse flowers. Porridge oats with honey, salted toffee and a mentholated sooty aspect as well. More slightly dirty seashore notes as well, such as salty rubber and bitumen. With water some smoked mussels, straw, cooked cereals and many more medicinal complexities. Long, briny, slightly ashy and full of bonfire smoke, citrus fruits, sandalwood and various oils and medical tinctures. Pretty thrilling really. A really great and rather emblematic late 1970s Port Ellen. Extremely pure distillate that gives an initial impression of brutality, but evolves into something more thoughtful and subtle. Rare Batch 38 09/05/2018 Three modern-era ‘legends’ are reviewed, from Balblair, Bunnahabhain and Springbank. Rare Batch 36 11/04/2018 Angus MacRaild argues in favour of Port Ellen’s allure with three extremely rare bottlings.